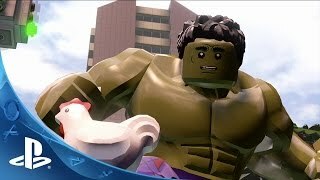 LEGO Marvel's Avengers — трехмерный платформер от студии Traveller's Tales. 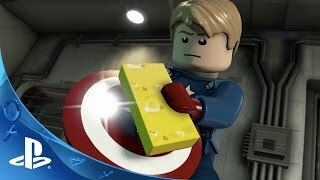 В LEGO Marvel's Avengers игроки берут на себя роли различных героев серии художественных фильмов Мстители (Avengers), чтобы сражаться с силами зла. 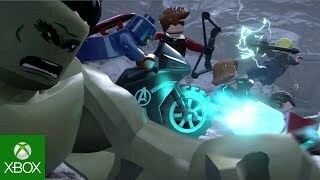 В LEGO Marvel's Avengers представлен редактор, позволяющий совмещать внешний вид и способности различных героев, для создания собственных персонажей. Помимо того, в игре представлен и кооперативный режим. I was absolutely delighted by the trademark TT Games humor and playfulness, and I absolutely intend to spend many hours in the game's free mode playing with my favorite superheroes and looking for Stan Lee in every single stage (he makes several priceless cameos). Several obtuse, tedious, or otherwise frustrating objectives and some level flow issues keep me from giving this an unreserved recommendation, but like the movies on which it's based, Lego Marvel's Avengers is a wild ride that many will come to cherish and want to revisit again and again. Seeing how TT Games pokes fun at Marvel’s films is worth the price of entry alone. The gameplay is also quite good, but it is a little rough around the edges. The biggest strike against it is secret characters aren’t as noteworthy as those in Lego Marvel Super Heroes. As a whole, LEGO Marvel’s Avengers will entertain the young gamers in the household, while providing short spurts of entertainment to seasoned ones. Avengers may not be the best in the LEGO series, but it does fit firmly within the LEGO gaming family. The story is straight from the movies, and is enjoyable for kids of any age – indeed, fans of the Marvel universe will likely have fun here too. Some technical hiccups and the occasional unclear objective can hamper your progress, but these can all be overcome in a game that exudes a fun-loving attitude throughout. LEGO Marvel's Avengers is fun, but unfortunately restricted by stubbornly sticking to the Marvel Cinematic Universe. Playing through LEGO Marvel's Avengers may trigger the sense of déjà vu if you've experienced any past games in the series. There isn't anything new to see here, and the franchise really needs a serious revamp if it's going to continue. Всё хорошее, что было в предыдущих частях, теперь никуда не годится. Всё, что работало, умудрились либо вычеркнуть, либо испортить. Авторы, очевидно, даже не пытались сделать что-то путное: эта бездушная поделка явно собрана не из любви к первоисточнику.